Design professionals face many decisions and options when choosing design approaches and materials that meet today’s more stringent energy codes for light commercial and multifamily construction. The variety of primary construction materials that can be specified differ between regions and cities based on climate zone, product availability, and historical preferences. As the energy codes have become more stringent, the insulation requirements for different climate zones can also influence changes in how exterior walls are constructed. Because construction materials can vary greatly in terms of energy performance, it is increasingly important to recognize the thermal performance characteristics of the specified products in project design. Wood naturally has a higher thermal resistivity compared to steel or masonry, making it a superior product for improving energy efficiency when used in wall assemblies. Wood studs have nearly four times the thermal resistance of steel studs or masonry blocks: A nominal 2x4 stud has an R-value of 4.38, whereas a 3-1/2” cold rolled steel stud has an R-value of 1.34, and an 8-inch nominal concrete masonry unit (CMU) has an R-value of 1.11. The 2015 International Energy Conservation Code (IECC) recognizes this difference and requires continuous insulation on steel and CMU wall assemblies. Some erroneously assume that the use of steel and concrete masonry wall systems with continuous insulation (c.i.) 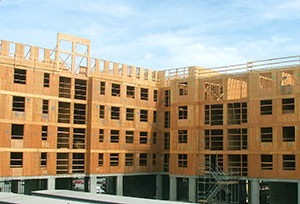 provides a wall superior in energy efficiency to wood framed construction without continuous insulation. This assumption is based on a misconception that continuous insulation mitigates the insulating deficiencies of steel framing and CMU walls by neutralizing the significant thermal bridging in non-wood structures. APA put this assumption to the test through an energy-efficiency analysis which compared steel framing and masonry block wall assemblies that use continuous insulation with wood-framed wall construction without continuous insulation. The purpose of this analysis is to determine the impact of three wall assembly types on the annual cost  of energy consumption  in the three different climate zones. Table 1 shows the three systems based on Group R occupancies for multifamily buildings in climate zones 3, 4 and 5. Three types of wall construction systems were selected from Table C402.1.3 of the 2015 IECC, and each system was evaluated for each climate zone. The design parameters are identical except for the type of wall system. The evaluation was done using RemDesign software, a nationally recognized tool for calculating the energy consumption of residential building designs, and is based on a 28,500 square-foot multifamily building with 256,500 cubic-foot of volume consisting of 27 individual units with 57 bedrooms. Climate Zone 5 – R Block + R-13.3 c.i. R-13 + R-7.5 c.i. R-20 + R-3.8 c.i. a. CMU wall defined as 8” nominal CMU without core fill insulation, and using continuous insulation (c.i.) as defined above. Component U-values for 9.5, 11.4, and 13.3 continuous insulation are 0.0908, 0.0774, and 0.0675, respectively. b. Metal framed walls assume 3-1/2” nominal steel stud 16” o.c. with R-7.5 c.i. installed on the exterior surface. Component u-value of 0.059.
c. Wood framed walls assume 2x6 exterior wall studs, 16” o.c. component U value of .060, with c.i. installed as required above. In climate zone 3, the annual cost for energy consumption of the buildings with the wood-framed walls was $1317.24. The cost of energy for the steel-framed and the CMU walls was $1308.03 and $1307.40, respectively. The results indicate that the wall systems, as listed in the IECC, have similar levels of performance in terms of energy efficiency in relatively warmer climates. In climate zone 4, the wood-framed, steel-framed and CMU walls result in an annual energy consumption cost of $1,030.14, $1,019.70, and $980.33, respectively. In this climate zone, wood-framed walls and steel-framed walls utilize almost the same amount of energy, while CMU walls with a thicker c.i. requirement perform slightly better. In climate zone 5, the annual energy consumption costs are $831.18, $978.65, and $912.65 for wood, steel, and CMU, respectively. In this climate zone, the wood-framed walls are required to have continuous insulation with a minimum R-value of 3.8 installed on the exterior. As a result, the wood framed walls reduce annual energy consumption by 18 percent compared to steel framing and by 10 percent compared to CMU walls. The benefits of using wood-framed wall assemblies become more apparent in increasingly colder climates . In evaluating the energy savings between a standard R-20 wall system and the R-20+3.8 c.i., the difference was only 0.06 percent, or roughly $8.00, a month in climate zone 5. This also assumes that the R-20+3.8 c.i. assembly has wood structural panel sheathing installed under the foam sheathing for structural design. The analysis also evaluated the annual energy consumption cost in climate zone 5 of an R-20 wall without the R-3.8 continuous insulation as compared to steel and block wall assemblies. The annual energy consumption costs are $960.34, $978.65, and $912.65 for wood, steel, and block, respectively. Even without the R-3.8 continuous insulation, the wood wall surpasses the efficiency of the steel wall framing with continuous insulation. Building designers frequently influence the type of exterior wall construction used in buildings. In determining the construction type to be used, designers need to take into account the many exterior wall performance requirements that will result in code-compliant, durable, comfortable and cost-effective buildings. As the most recent energy codes are adopted by jurisdictions, finding a balance between energy efficiency, structural needs, and construction cost is even more important. 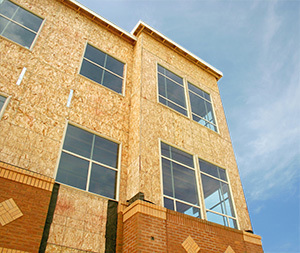 The natural insulating characteristics of wood framing and wood structural panel wall sheathing lead to better thermal performance when compared to steel and block. Continuous insulation increases thermal resistance to all wall systems, but as demonstrated in these evaluations, using continuous insulation over steel framing and block assemblies doesn’t always produce an equivalent level of performance to wood-framed systems. On your next project, consider that sustainable wood framing is not only more cost effective to build, but can also be more energy efficient. 1. Annual energy cost is RemDesign’s default energy cost which was used for each climate zone. It is defined as an electric cost of $0.08 per KWH and natural gas cost of $0.50 per therm. The analysis assumes individual heating and cooling units per multifamily unit, with 80% AFUE natural gas furnaces, and 13 SEER electric air conditioning units. 3. Above-grade wall heating and cooling cost is generally lower when going from a cooling degree climate to a heating degree climate. Further represented by utilizing natural gas heating equipment, overall building heating and cooling cost and energy usage (MMBTU/yr) is greater in heating climate zones; however, the above-grade wall cost of energy is less.